Some of you may remember me mentioning that my garden didn't do well this year. To be absolutely honest that is an understatement. It really did nothing at all. I was able to pick some shelly beans which I saved for seed, and I got a few cucumbers out of the garden. That was it. My husband says that it was because we bought a new pressure canner. We jinxed ourselves. I say it was because of all the rain we got, (we are still! trying to fix all the leaks in our roof). Whatever it was, our garden just sucked! But not everyone's garden fared poorly. My niece's garden did great this year. The rain didn't seem to bother her's at all. I am so jealous happy for her. :-) So what was the difference between her garden and ours? Her's was a raised bed garden. Ours was straight in the ground. I probably don't have to explain that with hers the water was able to drain, while ours was sitting in water. In fact our garden looked like a pond in some places! So while our garden did not do well at all this summer, we are not people who give up easily. I talked my husband into building some raised beds for us to plant our fall garden. It really wasn't that hard to persuade him. I asked and he said yes. The ones he built are small so that we can try them out and see how we like them. Also they were built from lumber we already had on hand, which also determined the size. After all, that is the point of being sustainable, right? I decided if we were going to do this, I should read up on raised garden beds. I already had a plan in mind and I was able to get some newspapers from the local library that they were going to discard. I thought newspapers would be great for putting down first to keep the grass and weeds out of the garden. Then I read where cardboard really is better because it breaks down slower. I was in luck, because of just moving my mother-in-law, we had lots of cardboard that we hadn't gotten around to recycling yet. Since I had both, I decided to use cardboard in one and newspaper in the other to see what works the best. I will have to let you know after this gardening season. So to begin, the garden bed is just a box. We already had these put together. 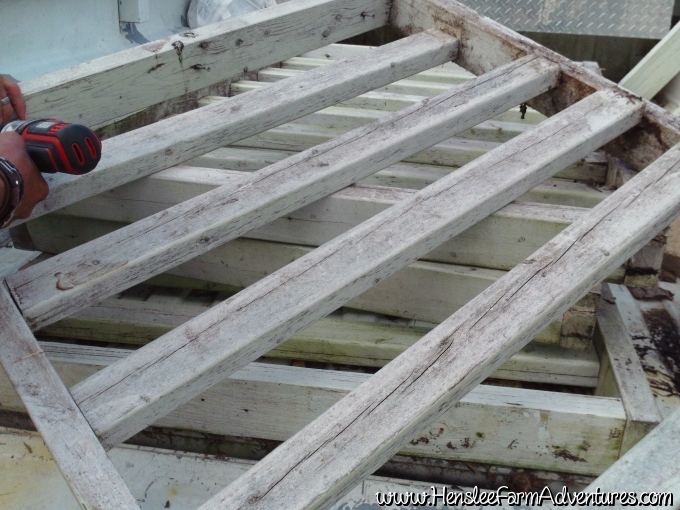 In fact they are parts of a porch railing which we took out the slats. Then we put two together to make it deeper. We wanted to make sure that there was enough root space for the vegetables to take hold. Stacking one on top of the other. Steve screwed the two together to that they would be more stable. Then we set them where we wanted. We decided we wanted them just outside our garden area, that way it would be easy to transplant in the spring. Our garden proper, will soon become a chicken run once again (the perfect pest control!). After that, I layered one with newspaper, and the other with cardboard. From this point on, it is hit and miss on what to do next. Some used a system that was cardboard, mulch, soil. Others put the soil right on top. We decided that on top of the newspapers/cardboard to first put grass clippings (that is our mulch), and then we put some chicken manure on top of that. I want to stress that the chicken manure that we used was not fresh. It was from a pile that we had sitting out composting, or as my dad would say it was "seasoned." Then on top of that we used soil. We had all of this on hand which is why we used what we did. The point was to make these without spending any money! While we were getting these ready and before we actually planted in them (thank goodness!) our dear sweet Abby (our boarder collie) decided she wanted to help. She did this by digging in them. So we decided that we needed covers for them. I was thinking along the line of just laying some chicken wire along the top, which we had plenty of, but leave it to Steve to get all fancy on me. He actually used a couple of more railing sections and built me covers for my boxes. He did use chicken wire and he even made me handles for the boxes from scratch! He used some stout wire that he had to fashion them. So here it is in all of its glory. Steve actually made me two more for a total of three. I couldn't be prouder of my little raised beds. The best part is that they cost $0 to make. All done and ready for the veggies to grow! Wondering what I planted? Well, I used seed that I already had saved so that was something else, I didn't have to buy. I planted carrots, turnips, peas, spinach, and green beans. 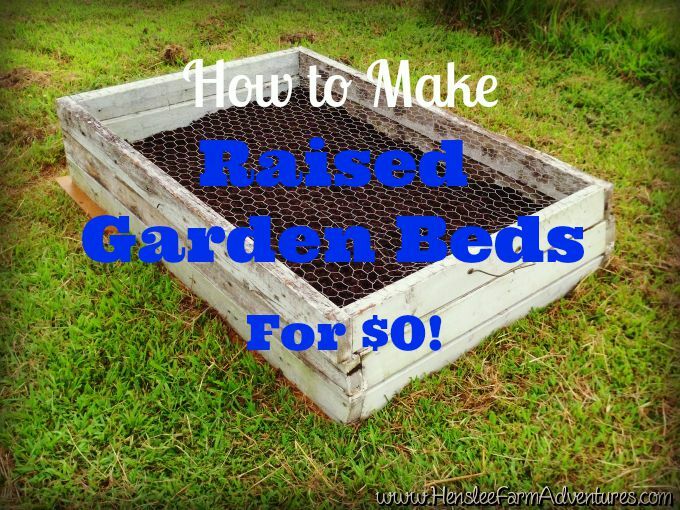 So tell me in the comments below, how many of you use raised beds?